Caractéristique suivante: 1. chaque produit possède une étiquette de numéro de pièce de fabrication unique sur l’emballage interne qui se révèle qu'il a été qualifié, qui comprennent le numéro de pièce, numéro de modèle et informations de date d’inspection ; 2. Si vous avez des questions sur l’élément, s’il vous plaît fournissez le numéro de pièce de fabrication pour vérifier, vos bénéfices seront garantis. 3.Made d'ébène, un accessoire utile pour votre instrument de musique. 4.Suitable pour violon 1/2. 5.Ultraportable et durable. 6.To remplacer votre tuning vieux et sale chevilles commodément. Fiddle Complete 4/4 Violin Parts. Acoustic Violin Size 4/4 full. Color Ebony. UPC 0799666100130. High quality at a low price. El Monte, CA 91731. 20-03-2019 18:42:25. Solve your tuning blues with the new 6B Ukulele Pegs from Grover. If your uke sounds like a dying cat, you need the new 6B Ukulele Pegs from Grover. Pièces de rechange pour contrebasse, contrebasse et basse violon. Tête de machine violon basse 2 pièces. Material: Jujube Wood. 4 pieces/set Jujube Wood. Full set of tuning pegs for 4/4 violin. Type: T uning pegs. T uning pegs. Note: The violin showed in the pictures is not included. Made of select j ujube wood. Excellent Set of Polished Ebony 4 1/8 Violin Pegs. Pièces de rechange pour contrebasse, contrebasse et basse violon. Custom style but from the factory. Grover model 8N Sta-Tite gear-style standard ukulele tuning machines.Nickel finish with round buttons.14:1 ratio. Requires 23/64" headpiece holes. High quality at a low price. El Monte, CA 91731. STA-TITE GEARED UKULELE PEGS (SET OF 4) 14:1 Gear Ratio Nickel Finish Hole Size 23/64. Grover model 6B Champion Sta-Tite ukulele tuning machines.Nickel finish with non-breakable black buttons.New design with nylon cone thrust washer for more secure tuning. Fits most ukuleles without modification. Complete set of 4/4 violin accessories. This should rejuvenate your violin to a classy one. The set consists of four nicely carved pegs, chinrest, endpin and tailpiece equipped with nice inlaid pearl parisian eye. Retract the setter. MODEL SM-DB. Simple procedure. It is model 164C. Its geared design will help keep your banjo's 5th string in tune. Upgrade to the tuner that is most respected around the world. Grover model 164C geared 5th tuning peg for 5-string banjo. Fine ebony pegs for 4/4 cello. Gold ring and pearl inlay. Hair is not covered by warranty, except for its installation. (In other words, if a bow's original hair falls out, that is covered.). Original hair installation is covered for a period of six months. A classy one. The set consists of four nicely carved pegs, endpin, tailpiece. Warranty does not cover strings. Bridges are covered by warranty for a period of three months. The Sky Music Strings warranty does not cover seam openings. MPN 649883. ou vieux violon. Country/Region of Manufacture India. Fiddle 4/4. Acoustic Violin Size 4/4. Violin Type Acoustic/Electric. Fine ebony pegs for 4/4 violin. Gold ring and pearl inlay. 07-08-2018 23:17:57. Country of Manufacture India. Original or Reproduction reproduction. Acoustic Violin Size 4/4. Violin Type Acoustic/Electric. UPC 0799666100222. Made in Germany by Wittner, Finetune CELLO Peg, very easy, quick, effortless and very precise tuning, made of high tech composite material and light alloy, the tapered peg is put in place without glue by simply pressing it into the pegbox just like any ordinary peg. As musical fans, we all know that violin peg plays an important role in adjusting violin pitch. You can apply it to replace your old or broken peg in order that tone can be improved or adjusted. 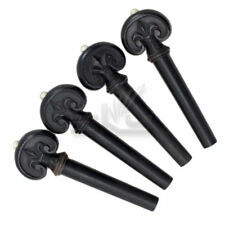 Made of ebony material, durable and long-lasting. PEG DOPE FOR: Violin/ Viola/Cello. Prevents slipping and sticking. Made in Germany By WITTNER! This is a really useful tool allows you to replace your violin strings quite quickly. Adjust it on your violin peg and within a few seconds the string is set ! Grover model 163C geared 5th tuning peg for 5-string banjo. Fine jujube wood pegs for 4/4 violin. Hand carved. Warranty does not cover strings. Bridges are covered by warranty for a period of three months. The Sky Music Strings warranty does not cover seam openings. 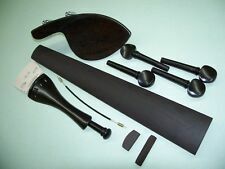 All in One Violin Chinrest Sets: Chinrest, Pegs, Endpin, Clamp, Tail piece & Tail Gut, Fit 4/4. Fine Jujube Products for Full Size Violin. Chinrest need drilled to fit. Violin Chinrest, Pegs,End Pin, Clamp, Tail piece&Tail gut, Jujube,4/4. Finely carved boxwood pegs for 4/4 violin. Warranty does not cover strings. Bridges are covered by warranty for a period of three months. The Sky Music Strings warranty does not cover seam openings.